If you've read Jeanette Detlor's history of her grandfather's career (Jeanette's Story), you probably have many of the same questions and thoughts that I have. Unfortunately, I haven't any answers either! But, as usual, in lieu of the missing facts, I like to brainstorm on the subject. I've done so at length with Jeanette, her husband John, Jean Findlay (our celebrity Knutsen cousin), and experts Tom Noe and Kerry Char. I invite you all to share your thoughts also, and hopefully, more clues will surface. This brand new, "undiscovered chapter" of the Knutsen legacy fascinates me! The first and foremost question is the chicken and the egg issue (or what I like to call the Knutsen Knundrum). Specifically, who taught who? Did Knutsen learn enough woodworking from his carpenter uncles to eventually build guitars, then instruct Anderson how to build his instruments? Or did Anderson, a fine cabinet maker, already know violin and guitar building, and teach Knutsen how to build guitars? Most of us are leaning towards the latter answer (and additional circumstantial evidence may be forthcoming in Jean Findlay's new Knutsen article "Mason to Manufacturer"). I'm not a luthier or repairman, and am nowhere near knowledgeable enough to discuss the finer points of guitar building - but we've all heard the bad rap that Knutsen has gotten as a luthier. Certainly much of it is justified (though the more instruments discovered, the wider the range of quality we're seeing in his work, from all periods). It's puzzling that Anderson's daughter refers to Knutsen as a violin player, rather than as a violin or guitar maker. There is no other information that suggests that Knutsen played the violin, though his eldest daughter clearly did, and Knutsen must have played the guitar. If this is not an error, it might mean that Anderson considered Knutsen more of a player than a builder. Or that Knutsen wasn't yet a builder at all. We know that Anderson was proficient by his first confirmed dated instrument (the one-armed violin in 1896), but we don't know when Knutsen built his first instrument (as stated previously, HGP1, the #4 "prototype" guitar, believed by Noe & Most to be from 1895, may have been built by Anderson). 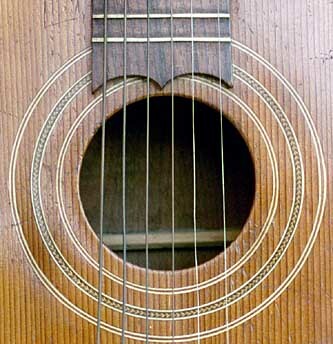 Furthermore, Anderson's existing harp guitar has been examined carefully by Tom Noe, and appears to be of finer construction than Knutsen's instruments. 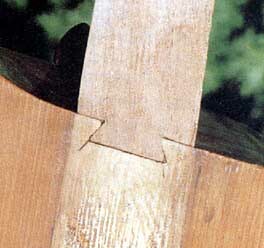 Among other subtle details, Tom noted the sanded braces and speculated that the heel joint might be the more intricate dovetailed joint - like HGP1. While at the Detlor's home, Tom and his wife Nancy also got a chance to see "beautiful cabinets and tables that Anderson made, including a gold-medal-winning table he displayed at the 1909 AYP Exposition." He also confirmed that "craftsmanship of all these works of art is precise and impeccable." Perhaps the second question helps answer the first: Why did Anderson build "two hundred instruments" for Knutsen? Knutsen seemed to be a loner, the Noe/Most book exploring how he resisted attempts to "productionize" to supply enough instruments to Dyer, and later, DeLano. His instruments bear this out - all handcrafted, unique designs, with no two ever exactly alike. Why then, would he require anyone to build additional instruments? One thought I had is that he hoped to supply Dyer for a Midwest/East Coast market, a relationship just recently discovered and poorly-understood (see Dyer). This agreement was begun in Port Townsend - but probably just as (or possibly after) Anderson left Port Townsend for Green Lake - so it would have been more difficult for a Knutsen/Anderson arrangement. Furthermore, Jeanette has found no information suggesting that Otto built for Knutsen other than while in Port Townsend. This would fit the second, and more likely, theory - that Anderson was hired to build Knutsen's first instruments - perhaps until Knutsen was capable of building his own. I have to wonder - is it a coincidence that Anderson's three years in Port Townsend coincide with Knutsen's first harp guitars? Another frustrating question for me is the stated "two hundred instruments." What were they? So far, no records have been found, and we may unfortunately never know. "200" sounds to me like a rough approximate figure Otto probably verbally gave to his daughter Ellen, recorded in her notes. While we can accept the figure, we can only speculate on the instruments. A handful of harp guitars and a couple hundred violins? Vice versa? A more even distribution, other types of instruments? I lay awake nights! - a Knutsen fanatic's curse I wish on none of you. Concerning Jeanette's harp guitar (HGP15) - this is, for all intents and purposes, clearly a Knutsen guitar, though one not intended for commercial sale. Despite our efforts to identify and isolate unique features of the guitar for the purpose of comparing and identifying existing Knutsen instruments, we have found no absolutes. Had there not been the direct trail of the guitar's history, we would just assume it was another Knutsen, with the usual (and unusual) variations. While the guitar was convincing proof of the accuracy of Jeanette's mother's story, it's interesting that Otto didn't build something totally different for his children. My suspicion is that these were "sanctioned" instruments which Knutsen allowed Otto to build for his family's use. The fact that this guitar, along with two of the other children's guitars (to be added soon), remained in the family to this day (never commercially sold) supports this view. I address the unique "One-Armed Violin" on a separate page - particularly the nagging questions of who designed it, and how it relates to the mysterious Livermore "harp"-violin patent (discussed in the Noe/Most book, and on my Similar Instruments page). Likewise the unusual "wrap-around" one-armed guitar (HGP16) - quite a puzzle! Regardless of all the speculation above, we can now safely revise the definition of a Knutsen instrument to include: May be built by Chris Knutsen, Otto Anderson, or others. I'll close with a list of features I suggest that we start considering as possible clues to identification of Anderson-built instruments. Note that these are only features to examine and ponder - my fellow researchers and I have not confirmed or agreed on any of these yet. One problem is that the features that we are trying to attribute to the two different men (as working hypotheses) seem to show up randomly mixed and matched on the instruments. 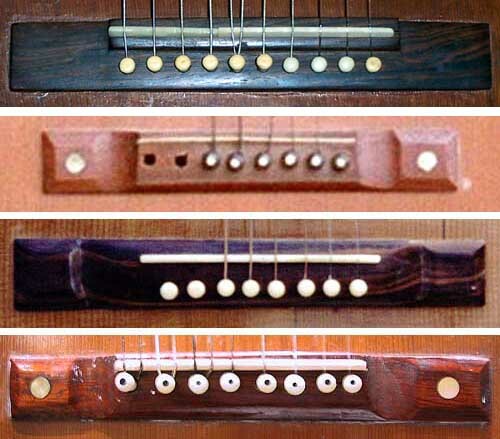 A plausible explanation could be that, in addition to full construction, Anderson also supplied Knutsen with "kit" guitars - for example, doing the difficult wood work (like the dovetails), and letting Knutsen assemble and finish them. Or perhaps they co-built certain instruments working side by side! However we choose to imagine the logistics, my main point is that there may be fully Anderson-built instruments, fully Knutsen-built instruments, and joint efforts. I'm limiting the discussion and comparisons below to the "Patent-style" guitars, as we believe at this point that the Knutsen-Anderson questions are only relevant to the Port Townsend "patent-style" harp guitars - though we shouldn't discount the later instruments. Fig 1. Note that it is all but impossible to confirm a dovetail joint without removing the fingerboard (HGP1). Some heels are glued flush. Fig 2. Knutsen expert Kerry Char has noticed a small nail "toenailed in" on some heels. Fig 3. 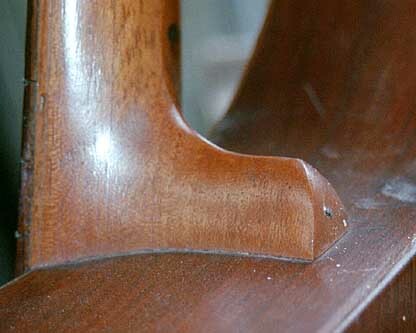 The heel of HGP15, a known Anderson-built guitar. Fig 2. Sub-bass harp guitars: HGP8, HGP9, HGP14, HGP4. Fig 3. Carved bridges: HGP15 (Anderson-built), HGP7, HGP13, HGP17, HGP22. Fig 1. "1896 Patent-style" guitars: HGP15 (Anderson-built), HGP1, HGP2, HGP3. Note the four noticeably different styles. The first two headstocks are veneered. Fig 2. 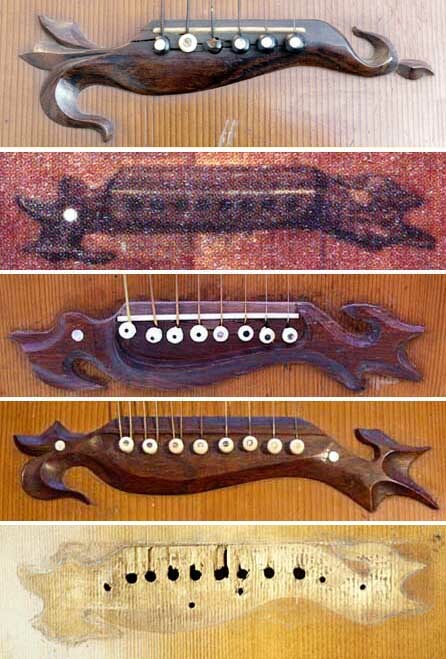 "1898 Patent-style guitars: HGP9, HGP7, HGP13, HGP4, HGP6, HGP17, HGP22. These all have full, straight slots. Note how the single friction tuner position varies! Some of these may be veneered. Fig 3. "1898 Patent-style guitars: HGP8, HGP14, HGP5. These have the individual beveled slots (like HGP3 above). 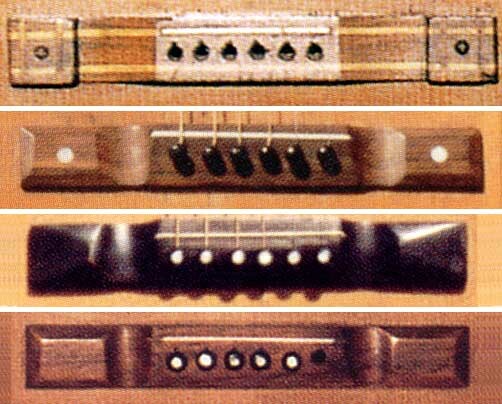 Note how the last one manages 3-on-a-plate tuners for both sides. Double scallop at end of fingerboard? Fig 1. Kerry Char points out the cruder inlay technique of HGP9, an assumed Knutsen (clovers inserted into circular hole, then filled in). Fig 2. 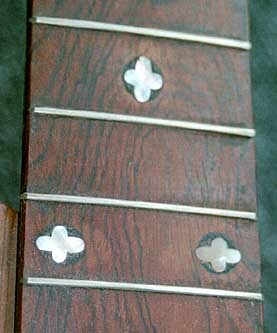 HGP15 (Anderson-built) has a double-scalloped end to the fingerboard. 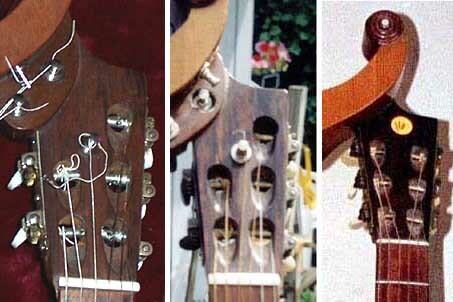 Only one other instrument has this - HGP11 - the patent-matching "moon and heart soundhole" guitar!